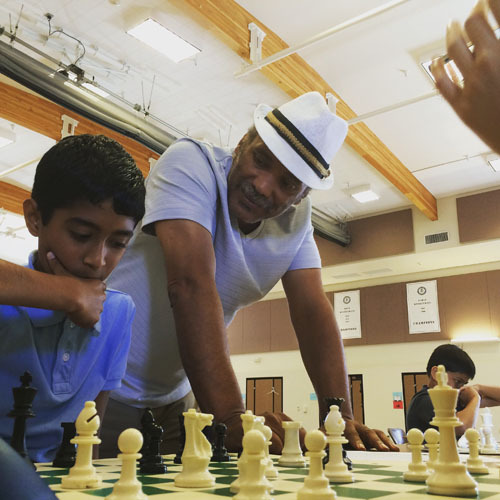 Two years ago today on October 17th 2015, Emory Andrew Tate, Jr. passed away after being felled by a heart attack at a chess tournament. The world immediately went into mourning and the stories started to flow about his chess adventures. On March 11th, 2017, a biography detailing the life of this most loyal acolyte of Caissa was released to the public. It was titled, Triple Exclam: The Life and Games of Emory Tate, Chess Warrior. No expense was spared to produce a work befitting of the heart and soul he gave to chess. The book was well-received and in six months the initial 500 hardback, full-color copies were sold to admirers far and wide. After the release of the book, many offered additional stories of his life and we will add a few here in his honor. We will also add some games that he played on the ICC. One of the most poignant messages was left by “Erob” on November 10th 2015 only weeks after Emory’s death. Tate, with that circus energy, like a clown on the high wire with no net underneath, laughing fearlessly at the crowd for refusing his invitation to join him, suffered never for a gentle smile, reassuring that we act by gift of our own wonder. And that Rolls Royce of a brain he carried, thundering down the slope of an unjust society, surely will find respite in the place where all like Socrates must go. But should his ghost decide to linger… our swords will sharpen… and our friendships will grow… in unpredictable ways. Memories of Tate have been immortalized and one can only give a wry smile when recounting the countless stories that cannot be captured in a single book. There is a saying that everyone has an Emory Tate story. Maybe not, but there are hundreds! A few months ago, Frank Johnson shared with me an anecdote of Emory’s determination. On one weekend, Emory took the Greyhound bus to a tournament. While he traveled lightly he would sometimes bring along something to read. 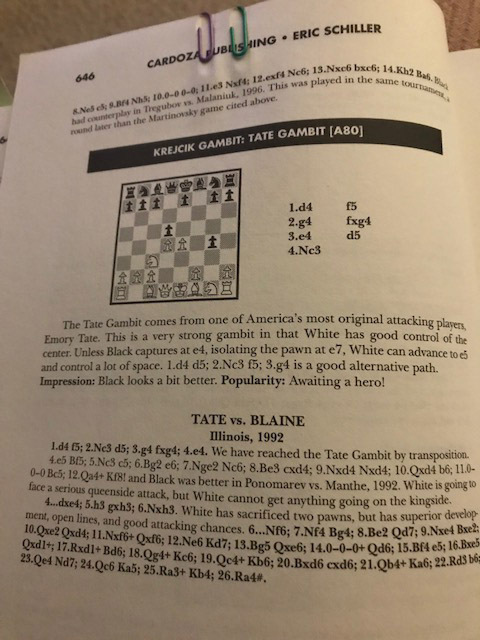 On this trip, Emory toted around his Anthology of Chess Combinations, a book of 2001 combinations from practical games. It was a book he found great beauty in and cherished. Unfortunately, he left his book on the bus and when he discovered that it was missing, he returned to the depot only to see the bus pulling off. Emory, with his asthma-riddled lungs, chased down the bus in hopes of flagging it down. Generally buses will not stop, but somehow he got the bus to stop! Panting and out of breath, he got onto the bus and retrieved his prized possession. Having pulled off an unlikely task, he merrily went on about his business! 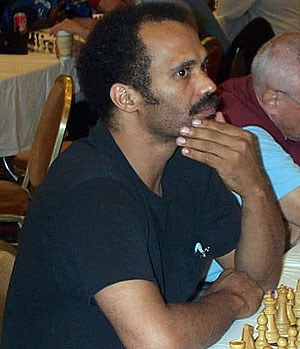 Emory competing at the 2001 World Open in Philadelphia. His games always drew a watchful eye. I also got a number of stories highlight Emory’s drinking prowess. For those who read Triple Exclam, this was a sordid chapter in his life. 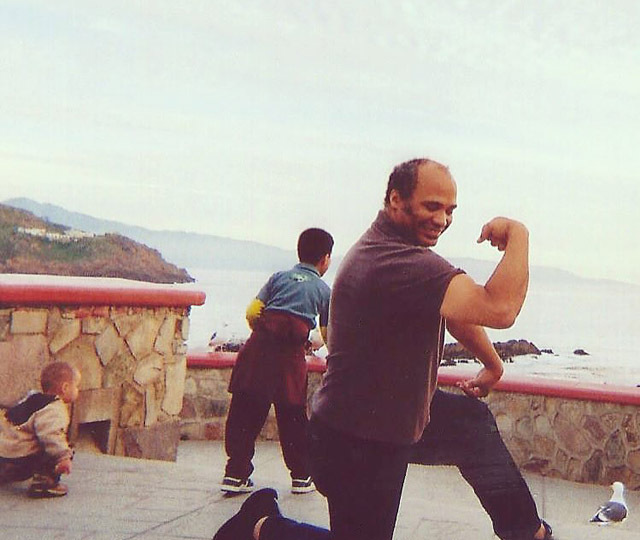 Chris Torres, a close friend of Emory’s, told me that he would drink in order to “shut down his mind.” There was certainly a lot of energy that he was generating, a lot of thoughts percolating and a cooling off period was needed. Emory was troubled, but would look for (and find) a place of solace. Of course there many ways to do this. One that he chose was to imbibe in spirits to assuage his troubles. Another is to find a place to unwind. One of his favorite resorts was his mother’s home, a house sitting on secluded acreage tucked into rural Alabama. It brought him the solitude and time to reflect. It was said that he considered returning back to Alabama prior to his passing. It was easy to understand why Emory appreciated beauty. 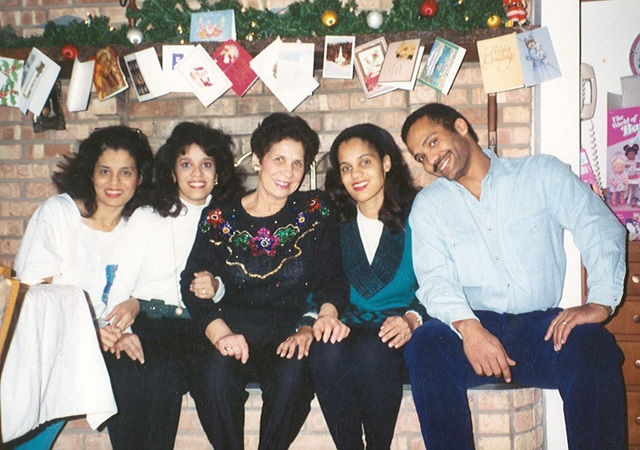 Here is a family photo from the 90s of Emory with sisters Emory Denise and Katrinka, his mother Emma and youngest sister, Elizabeth. While I was in St. Louis for the 2017 Rapid & Blitz tournament, Maurice Ashley told me a story about Emory’s “Mad Max” persona. In the late 80s, Emory drove three hours from Baltimore to New York. He decided to show up at Maurice’s doorstep in Brooklyn urging him to play in a Chicago tournament. Granted, it is a 12-hour drive from New York to Chicago and Maurice would not be doing any driving. What would follow would be a nightmare of a drive according to Maurice. The story doesn’t end there. They get to the tournament in Chicago and Emory doesn’t have a room. By now, Maurice was obviously irritated, but Emory tells him, “Don’t worry.” After some time, Emory comes back and says, “I have a room.” Maurice was dumbstruck and how Emory could pull that off so fast! Of course we now know that Emory had built up tremendous social capital in the chess world and would cash it in at various times. 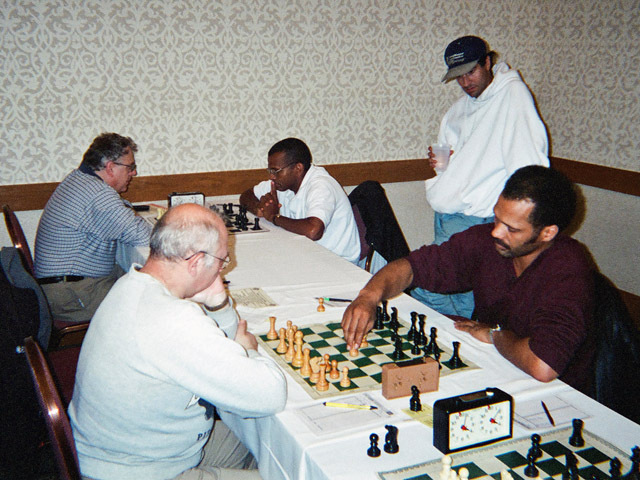 What happened was that Emory had met an admiring player who was glad to have two strong masters to stay with them and perhaps analyze their games. Not only did they have a room to stay in, they got the beds! What an emotional roller coaster for Maurice that trip must’ve been! With a clear mind Emory was an artistic magician who reveled at the delicate mysteries of chess. He wanted nothing more than to share his joy in a post-mortem session. His presence has been sorely missed. I have received a number of offers of stories, photos and more of his games. William Aramil sent a number of games Tate played on the ICC and a few are shown below. made his mark and it was indeed a Triple Exclam. What is interesting to note is not the tactical flourishes that Emory played, but the passion that brought about these fantastic ideas. In essence, one would be skilled if they solve difficult combination puzzles, but it requires more skill to get such positions. The beauty of Emory’s presence is that he was willing to show you how he did it. He was an artist who wanted to show his work, not for the sake of self-aggrandizement, but to show the beautiful idea contained in chess. Therein lies a beauty to behold, an inspiration to be felt and a lesson to be learned. Was talking to C.K. Damrosch about Emory and he stated that Emory used to troll the class sections watching all the beginner-level games. He was amused and even inspired by the wild nature of the games and some of the idea. Of course there is quite of bit of bravado when one lacks a sense of danger. In Emory’s case, his bravado came in spite of the danger.